it's all too easy to look back and think it was an underwhelming year for the company. Sure, the Mouse has no worries financially; in theaters, only one Disney-branded film failed to meet expectations or earn "hit" designation, while the ever-blurring line of TV/music found the Disney Channel franchises of "Hannah Montana" and High School Musical riding high on sold-out concerts, record-setting sequels, and best-selling albums. Artistically, though, the successes were scattered and even then mostly limited to just a handful of pleasantly surprising movies. DVDs and CDs took a dive both in quantity and quality, most falling into a narrowcast niche rather than the type of universally-pleasing works most often associated with the "Disney" name. No good road trip is complete without a round of showtunes, especially with the movie musical presently on a grand upswing. 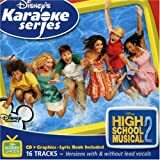 The newest installment of Disney's Karaoke Series makes that a lot easier, providing the original background music and vocals from High School Musical 2 to accentuate (or drown out) your own singing. These fun, heavily pop-infused songs lend themselves to a sing-along as much as any staple of '80s radio ever has, so a karaoke CD seems like a given. In order to adhere to the line's 8-track format, the CD omits three songs from the HSM2 soundtrack: "All for One", the 'Sharpay version' of "You Are the Music in Me", and the one song that would unquestionably provide the most challenging sing-along: "Humuhumunukunukuapua'a". Departing from customary practice, Disney has actually provided the songs as they are heard in the movie, complete with original vocals for the vocal versions. With its lower list price, that makes this a potential substitute soundtrack for the movie, if you can bear with the three songs' absence and the karaoke CD's lower audio quality. Of course, most people buying this will likely already own the soundtrack, so a full set of instrumentals would have been a better move. For those with a karaoke machine, the CD is equipped with CD+G technology, meaning that lyrics and graphics will appear on a TV screen as the music plays when used with the karaoke player. For those who haven't yet added such a system to their home theater, the CD will work like any other in a regular player, only with a few moments of silence at the beginning of each track. The lyrics to each song are helpfully printed in the liner notes. If you've taken a liking to the High School Musical franchise, then a night of karaoke with these catchy tunes is probably for you. Heed this warning, though: The first movie saw not only separate releases for the soundtrack and a karaoke album, but also a double-disc Special Edition that encompassed both. It's a safe bet that the folks at Walt Disney Records already have something similar up their sleeves for the second movie. So while the karaoke itself comes recommended, it might be best to hold off for a re-release, which will hopefully surpass this one by including the complete soundtrack in karaoke form. 6) "This is My Time"
14) "This is My Time"
16) "Anytime You Need a Friend"
Disney continues to leave no stone unturned when it comes to karaoke and no youthful demographic neglected when it comes to music. With the Disney Princesses every day becoming more and more suited for toddlers, this CD should appeal to older girls who have lost appreciation for unnaturally pink frills but are still too young to be jaded by mass production. 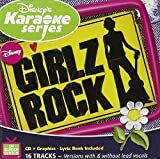 The title Girlz Rock refers to a 2005 album. Fans of that album will be sad to hear that only 8 of its 15 tracks are carried over here. The featured songs, all of the tween-oriented hits variety, were originally performed by Aly & AJ, Hayden Panettiere, Raven and others who predate Hannah Montana and High School Musical (I cringe to call 2004-2005 simpler times). The only official Disney tunes are found in the form of Mulan's "Reflection" and "Anytime You Need a Friend" from Home on the Range. As this CD is designed more for sing-along fun than listening pleasure, it's rather pointless to rate it as far as aesthetic appeal goes. That said, the demo singers are reasonably adept, and while the instrumental versions are heavy on back-up vocals, what pop star of today is truly able carry a song on her (or his) own? All in all, if bubble gum karaoke is up your alley, this is worth a listen. Otherwise, look elsewhere for your musical needs. Ever bought a CD just to discover that only one of the tracks was worth spending any money on? If so, then brace yourself for some déjà vu before buying Disney Channel Holiday. In this case, the redeeming song is "Greatest Time of Year" by Aly & AJ, a rock-tinged ode to the season that you likely heard somewhere this year. The rest of the album is primarily comprised of the kind of forgettable schlock that one might expect from something bearing the Disney Channel brand. Though the Radio Disney crowd assembled here has occasionally proven themselves more than poorly manufactured pseudo-stars, you wouldn't know it from this compilation. In all fairness, there are a couple of songs that are at least tolerable. Monique Coleman pulls a rabbit out of her hat with an unexpected cover of "Christmas Vacation", the theme to the 1989 Chevy Chase comedy. She gets points for the element of surprise but while she sounds like a competent enough singer (heard alone here for the first time, despite starring in both High School Musical films), the production is pretty bland. 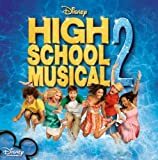 The same is true for Coleman's HSM brethren -- Lucas Grabeel, Corbin Bleu, and Drew Seeley -- their songs provide a little bit of fun but are impossible to recall moments later. Even the Jonas Brothers' noisy Mariah Carey rip-off can grow on you. The bulk of the songs fall far short of decent. Miley Cyrus/Hannah Montana delivers history's most straightforward and predictable rendition of "Rockin' Around the Christmas Tree" yet still manages to one-up her father, whose age and experience sets him apart from everyone else on the CD. Unfortunately, Billy Ray Cyrus sounds nothing like the veteran he should be by now, making a sloppy, over-amped mess of "Run Rudolph Run". Ashley Tisdale is nasal and nigh inaudible on her cover of Wham's "Last Christmas." Kyle Massey's "Jingle Bells" rap is a joke. They all look like Nat King Cole reincarnate, though, next to The Cheetah Girls, who forget the lyrics to "Have Yourself a Merry Little Christmas" halfway through and resort to their usual caterwauling of "Cheetahlicious" this, "Cheetahlicious" that. 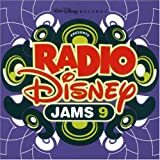 If something in the same vein as Disney Channel Holiday interests you, then track down 2005's vastly superior Radio Disney Jingle Jams album instead (read our review here). Come next Christmas, you'll be a lot more jolly if you do. The last time Alan Menken and Stephen Schwartz teamed up for Disney, the company's animation department was in the late hours of its heyday. With their most recent collaboration, Enchanted, it looks as though those days have returned. With only three big numbers, the duo has turned out a fairy tale musical for the ages, trumpeting the renaissance with more flair than anyone would have expected. Whether accompanied by cartoon animals, a big ensemble, or the dynamic James Marsden, Amy Adams proves herself a worthy vocalist as Disney's newest princess. The movie's big showstopper, "That's How You Know", is an instant classic that sits comfortably beside behemoths like "Be Our Guest" and "Under the Sea". The soundtrack CD places this and the movie's other songs alongside the score to offer a near-complete Enchanted experience in just under an hour. The genius of Enchanted's music -- much like the genius of the movie itself -- is its ability to delightfully tease the Disney musical while waving a top hat and kicking the can-can. So when "Happy Working Song" echoes "Whistle While You Work" and rhymes "dum dum dum" with "vacu-um", it all feels so right. Likewise, "True Love's Kiss" marries "Someday My Prince Will Come" with "Once Upon a Dream" with only the mildest innuendo ("lips are the only things that touch"... sarcasm?) and great results. Schwartz is a fine stand-in for Menken's late lyricist, Howard Ashman, matching witty words to Menken's playful music. The sing-song portion of the soundtrack concludes with the final track, James Marsden's "That's Amore" cover, a decent rendition heard only briefly in the film but thankfully preserved on the CD. Until the ten-minute "Storybook Ending" comes along, Menken's score is served in small doses, though highly enjoyable ones. Occasionally raucous as expected, the score is for the most part thematic and easy to listen to, working in the melodies established elsewhere in the film. Menken calls back to his Little Mermaid score for many of the compositions and even samples his own "Beauty and the Beast" in "Nathaniel and Pip". There are a couple of pop tunes thrown into the mix too. Jon McLaughlin's "So Close" is a snoozer and destined for the "skip" button. Carrie Underwood strikes gold again, however, rescuing "Ever Ever After" from the forgettable fate that its simple beat and flimsy lyrics had set out for it. The country powerhouse goes easy on the twang for this radio-friendly ditty but doesn't hold back on the pipes. The end result is a song that fits in perfectly with the rest of the CD and emerges as one the decade's better FM movie themes. It's a shame the song hasn't been better promoted. The lack of a few reprises is offset to some degree by the inclusion of Underwood's music video on the CD, accessible when inserted into a CD-ROM drive. The good news is that the Mickey Mouse application works on both PC and Mac. The bad news is the video is pretty low-res. Nevertheless, in an age where music videos aren't easy to see legally, it's nice to have this fun and creative production available for relatively easy viewing. Also scoring points is the inclusion of the lyrics to all but "That's Amore" along with some pictures in the liner notes. Together, Menken, Schwartz, Adams, Marsden, and Underwood make a great album. 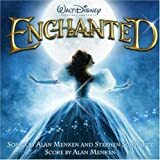 With a handful of excellent songs and an enjoyable score, Enchanted is this winter's must-own soundtrack. Running Time: 7 minutes / Release Date: 2007 / SRP: ? After more than a decade of avoiding the format, Disney has gotten back into CD singles, giving the treatment first to High School Musical 2's most anticipated hit and now to this, a secondary recording of the standout single from country musician/Disney Channel father Billy Ray Cyrus. This duet of "Ready, Set, Don't Go" brings together Dad's broody twang with the mainstream pop sound of real-life/"Hannah Montana" daughter Miley Cyrus. The results are similar to a typical Take Your Daughter to Work Day -- it's okay and something different, but not something you'd want on a regular basis. If you listen to Radio Disney, I'm sure you already hear this plenty and, even if you don't, I can't imagine you're eager to give a standard jewel case of shelf space to two barely different versions of the same song. Still, if it's the sold-out concert act Miley that floats your boat and not the coattail-riding father (who should be singing "Ready, Set, Let's Go"), this is a nice way to get the song without buying Home At Last, the Billy Ray album it was penned for. Of course, you could already do that on iTunes and with this single not available widely (or maybe at all? ), that's still your best bet. 1) Troy - "Bet On It"
2) Karaoke Instrumental - "Bet On It"
3) Troy - "Bet On It (Remix)"
This CD single is less of an enigma; it was released on the day that High School Musical 2 came to DVD, but only at Best Buy stores. Movie and music studios regularly give Best Buy and other retail giants exclusive incentives to throw them a little traffic bonus. In this case, it'd be a very small traffic bonus. Anyone loving this absurdly lucrative Disney Channel franchise surely already owns the sequel's soundtrack. That's already been given the Disney Karaoke Series treatment, so Track 2 (instrumental but retaining the chorus and lines of background support like "Did you ever?") isn't too special. Thus the CD's uniqueness can be thus summarized: a mild dance-club remix, a lyrics booklet that folds open into a Teen Bop-type Troy poster, and a somewhat neat, colorful 13-page HSM2 2008 calendar that has to be printed from an Adobe Acrobat document. As for the song itself, it's much less entertaining without the accompanying images of Zac Efron prancing through a golf course, leaving it merely generic and unspectacular like most of its crowd-pleasing kin. Interestingly, Zac Efron's name only appears in the poster's signature reproduction; the song is credited on the cover and elsewhere as "Performed by Troy." Hannah Montana made as many headlines in 2007 as any Disney property, most of them about album sales and her sold-out nationwide concert tour. While the buzz may be largely unwarranted, the light pop music remains fairly appealing, especially when extracted from the feeble sitcom that first exposed it. This 2-Disc Special Edition isn't an absolute upgrade, but its additions -- a bonus track, corresponding concert performance, the half-hour special "Backstage Secrets", and some in-case goodies -- more than make up for the loss of the 5-song concert DVD included in the bestselling soundtrack's original release. Doodlebops: Get on the Bus! A year later, the Doodlebops haven't lost their way. Their fun, diverse music still holds the power to please more than the young kids it's aimed at. The Mouse's second release of the vibrant Playhouse Disney act again follows (and narrowly improves upon) an identically-titled album issued in Canada. Disney continued to show unwavering support for the CD+G format with an array of sing-along albums. Inevitably, the company's top-selling album of 2007 got the treatment. It's a cut above the rest, thanks to the inclusion of original vocals and instrumentals. It comes as no surprise that this concert album from modern music's least talented trio earns our loudest booing of the year. Poorly constructed songs and cat-scratch singing aren't apt to shake anyone's tail feather, nor is the choreography on the bonus DVD. This is one party for which you definitely don't want to RSVP. It was the subsequent Hannah/Miley two-disc set that topped charts, but this rerelease proved that the brand of tween-tailored pop was slightly better when it was new. The bonus DVD dives into the every girl's fantasy that's integral to the appeal. After years of providing Disney with singles and pop covers, the three sisters of Everlife finally recorded a full album for the company. Comprised of soundtrack selections, new recordings of old songs, and more covers, the CD moved the no-longer-teenaged siblings away from their contemporary Christian origins but kept them a notch above their Radio Disney kin. Though it didn't burn up the sales charts the way the standard soundtracks and DVDs have, this extension of Disney Channel's lucrative franchise does a fine job of transferring the original movie's fun to the stage. As an added bonus, it included a 23-minute DVD of concert videos. Though this inevitable follow-up abandoned its predecessor's Broadway sound for a distinctly radio-friendly pop vibe, it still delivered a set of undeniably catchy tunes that will have the world signing along for years to come. The soundtrack's bonus song, taken from a deleted scene, added bait to the hook. Consumers bit, putting the album at the top of the Billboard charts and making this the second best-selling CD of 2007. A compilation of fifteen pop tracks from the last few years, Radio Disney Jams 9 pulls from not only its native airwaves but from the mainstream charts as well. The songs here are bona fide hits that you're likely to know and maybe even love. 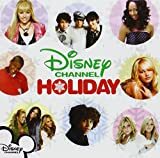 Even with Hannah Montana, T-Squad, and The Cheetah Girls dumbing things down, the album promises a good time and even throws a bonus DVD into the mix that is light on content and heavy on bass but worth watching nonetheless. Hans Zimmer returns to the blockbuster Pirates franchise with a surprisingly different and eclectic score. Intriguing in its composition and evocative of the movie's adventuresome spirit, the soundtrack is good even in parts where the film wasn't. With score selections, pop songs, and elaborate showtunes, Enchanted runs the soundtrack gamut. Though one song is decidedly lackluster, the other tracks more than compensate. Featuring a fantastic vocalist in Amy Adams and a welcome reunion of Alan Menken and Stephen Schwartz, this soundtrack is an instant Disney classic that deserves a spot beside the studio's very best. In its second attempt to meld a tradition in storytelling with 100% computer animation, Disney fared much better. 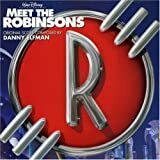 Meet the Robinsons marked a significant improvement over Chicken Little in just about every way, including musically. Its original songs performed by the likes of Rob Thomas, Rufus Wainwright, and the All-American Rejects complement yet another fun Danny Elfman score, making this eclectic album a most rewarding surprise. Article published January 7, 2008. CD reviews written by Aaron Wallace, Renata Joy, and Staff.